Fantasy Flight Games has made a digital version of this game that works on iOS devices, Mac OS X and Android! A look at the story, components and gameplay. Wil Wheaton and guests Felicia Day (Actress, Producer, Writer - The Guild), Mike Morhaime (President, Co-founder - Blizzard Entertainment), and Bill Prady (Co-creator, Executive Producer, Writer - The Big Bang Theory) play Elder Sign! Even as the “simpler” game, there are tons of small pieces here; several pages of cardboard to punch on first opening and several separate decks of cards to wrangle. But the rulebook is concise and helpful, so my first game started around 30 minutes after opening the box (this was a solo game, so there was no rules explaining to be handled). That first game was won in under an hour, albeit with a few mismanaged rules. Once comfortable, the game takes me about 10 minutes to set up and under an hour to play, whether that’s alone or with 4 others. It takes one game to fully understand all of the rules and nuances of Elder Sign… maybe one additional game to understand how to best utilize spells and items. After that there is no learning curve. And the game can be taught to others in less than 10 minutes. This is a simple game wrapped in the cloak of a complex one. I have played Elder Sign solitaire and with 1 to 4 other players. I’ve played it with people who like dice games and with others who do not. Their reactions varied between liking and tolerating Elder Sign, but nobody absolutely loved it. This game is just not suitable for children. Ignoring the weapons and monsters, it (as well as all Arkham-themed titles) is essentially a period-piece game. It can be quite charming if you fully wrap yourself in the 1920s setting, but that’s not going to interest a child. I would say this shouldn’t be on a parent’s radar until their child is old enough to read Lovecraft themselves – probably early teens. This game is the board-game equivalent of Kevin Bacon – you can tie just about any game to it in some way or another. Comparably-themed games include Arkham Horror, Mansions of Madness, Call of Cthulhu LCG, Fluxx Cthulhu, Smash-Up: The Obligatory Cthulhu Set… this is well-trod material. If you’re fully invested in the story of the game (i.e., you can pretend those face-up cards are actually rooms in the museum that you’re exploring for clues) it can run close to dungeon exploration games. And above all it is a horror-themed dice game like Zombie Dice or Cthulhu Dice (again with the Cthulhu! )– although quite unique here in that it’s cooperative. In fact, it’s the only cooperative dice game I’m aware of. I play Elder Sign about once a week, but mostly as a solitaire game for nights when time is limited and I have no one to play with. If I have a group this is quite low on my list of games to bring out. It just doesn’t immerse me like Arkham Horror does. I’ve read countless reviews on this website by smarter gamers than I that condemn a game for “pasted-on” theme… I think that’s what we have here with Elder Sign. But that’s not the biggest problem with it; this is the easiest game I have ever played. I’ve never lost. I’ve never even gotten to a battle with an Ancient One. 30 or so games, many with brand new players constantly making errors… still have all the Elder Signs to seal the big baddie away before it wakes up. One very lonely Friday night I played for 3 straight hours – with only one investigator (Sister Mary) – and locked away every Ancient One in the game as a campaign. 8 Ancient Ones and a bag full of monsters, and I was able to keep one little nun alive through all of it. And we criticize Castle Panic for being too easy? To begin with, I want to place a couple of disclaimers to this review. One, I see this game compared to Arkham Horror a great deal. I have played one game of Arkham Horror, and while I enjoyed it, it was years ago and I do not really remember it. I therefore will not be making the comparison. Two, this game gets a slightly higher rating out of me because I have created some alternative rules to play this with my 3 1/2 year old daughter, and a good chunk of the times I have played it with her. This review, however, will focus mainly on the vanilla, adult version. If you are curious how I make this work with my daughter, I have a house rule outlining it in the game tips. If you are familiar with H.P. Lovecraft’s work, this is yet another derivative of it. If not, you really do not need to be to play this game. Suffice to say that his fiction deals with creatures of immense power and terror. Often regular folk stumble upon these critters trying to enter our world, and just investigating the phenomenon is often enough to drive men mad, let alone seeing them manifest. The setting is based in the universe of his making. One of the Great Old Ones who are older than time itself is getting ready to awake with the help of a fanatical cult. The museum in which the game is played is ground zero, and only a handful of investigators stand in the way of the horrific creature entering our world. You and your friends will take on the role of these poor saps as they keep the bogeyman away. By exploring the museum and uncovering its secrets, you can gain the tools needed to do so. Everything seems sturdy enough to me. I am not much on card art, so my opinion matters little on that front, but for what it is worth it is a realistic style. Everything looks like modern depictions of the 1920’s. So, we have a ton of cards and a ton of little cardboard markers. What do we do? The game plays 1-8 players. There are (if memory serves) 16 investigators. Everyone playing chooses one. Each one has a stamina and sanity rating that always total 10. Some folks have stronger minds and some stronger bodies, and some fall in between. If everyone takes characters with high sanity attributes, for instance, everyone may end up bleeding on the floor because no one can tackle high stamina cost adventures effectively. Each investigator has a special ability as well that is unique to them, be it extra items gained during play, ability to heal your friends, re-rolling undesirable results, you get the gist. You will randomly (or by agreement) choose a Great Old One to do battle with. Each one has different effects on the game, just as the investigators have different abilities. I would say Yig is the easiest and Cthulu is the most difficult, but that is certainly debatable. Each one has a different number of Elder Signs needed to seal it away. The Yellow die has no terror but has a 4 investigation, and the red die is the same as the yellow, but replaces the 1 investigation with a wild that can stand in for any of the above or 4 investigation. The adventure tasks will have varying combinations of needed symbols. Two lore can be completed with, well two lore, and 7 investigation can be completed with any combination of investigation dice equal to or greater than 7. A task must be completed in its entirety in one go, and all of the tasks on an adventure must be completed in one investigator’s turn. If you roll the dice and cannot complete a task, you may discard one of the dice and roll again. When you discard a die, you have the option to “focus” a die, or save one die on your character card as long as you are not already doing so, to save for a future roll this turn only. The more you fail, the less dice you have to continue attempting. Should you fail to complete all of the required tasks in an adventure, you suffer the consequences listed on the card. These usually are damage to your stamina and/or sanity, monsters added to existing adventure cards or doom tokens. Succeed, and reap the rewards of the adventure. These can be items, portals to other worlds with greater rewards, and the titular Elder Signs. The overall goal of the game is to acquire a certain number of Elder Signs indicated on your bad guy card to seal it away and save the world. Amass too many doom tokens, however, and the Great Old One awakes. Dealing with an awaken Old One usually results in death, but it is possible, albeit unlikely, to seal it away. The Old One essentially replaces your adventures at that point and you need to roll the indicated combination on the card to remove a doom token and have to bring the total to 0 to win. At least one Old One wins instantly when awakened, however. Some adventures can have negative effects on the world even when completed successfully, however, so sometimes you have to weigh risk vs. reward. It could cost sanity or stamina to complete a task, or completing an adventure could summon a monster. Monsters represent either cultists trying to summon the Old One you are trying to fight or horrors that have escaped into this dimension. They can replace certain tasks on adventures, or get added if none of those special replaceable tasks or available. They are once again defeated by rolling specific combinations of dice. Also, by defeating monsters and completing adventures, you keep those cards for the value of the trophies they give you. Trophies can be turned in for healing or items at the entrance in lieu of taking a turn. Every investigator turn, the clock moves three hours. When it goes all the way back to 12, it is Midnight (basically every 4 turns) At midnight, mythos cards are revealed, generally summoning monsters, adding doom tokens and causing harm to the players, first right when revealed and again the next time midnight hits. Some adventure cards also have consequences at midnight if you didn’t complete them prior. So, that was a lot going on, but I will tell you that you will have this figured out by the end of your first game easily, and next game you will barely read the rules. Personally, I enjoy the heck out of this game. There is a heavy random element, being a dice game after all, but I enjoy the theme, and apart from that the gameplay as a whole. If you are not a fan of dice games, I would steer clear. But at $35.00, you could do a lot worse. Biggest cons are setup and tear down can take a bit, and nothing will ever fit in the box properly without a bunch of ziplocks, but I find these to be easy to overlook once the game gets going. Overall, I believe that the designers did a very good job. There are many different characters (in this game called “investigators”) each having their own unique ability. There is a magician, a psychologist, a salesman, a doctor and many more. You can increase the fun of this game by role playing a bit if your into that. In this game, you don’t have a game-board but over-sized cards, which represents the different rooms of the museum. Because there are plenty of rooms, the replay factor of this game is medium to high. Except for the normal rooms, there are “Other World” cards. When you complete an investigation successfully, it might open a gateway too these Other Worlds. It’s a fun extra they included in this game. ES is a dice rolling game so I would suggest to increase your positive karma as much as humanly possible , because it really *peeps* if you keep on failing investigations. You will feel down and useless.. this is probably one of the downsides of the game. Even if you win, you can feel bad because you didn’t do much to help achieving the victory. Now, even though this game is mostly luck based, you can change the outcome of an investigation by using items (ex. ->Dynamite<-, Guns, etc), allies, personal abilities or even mighty spells. The downside of the items is that there aren't many different effects. Most of them just adds an extra die and that's it. It would be better with a larger variety of effects. I've already played it a couple of times and it feels like it's impossible to lose. Some of my "Fellow Investigators" weren't really thinking a lot and were making tons of mistakes and we won by far.. so maybe this game is a little to easy. Conclusion: If you like playing coöp games and you don’t hate the horror theme, it won’t be a bad buy…it even will be a good buy! The game is beautifully designed and well made. It doesn’t take long to set up and it takes 1-2h to play. Have fun! Elder Sign follows the traditional Lovecraftian saga that we have come to know and love, but this time, it takes the battle to a creepy museum, filled with artifacts and strange creatures that ache to invade our world and bring about the coming of the Ancient One. And once again, the only things that stands in the way of the people of Arkham and the coming darkness are those crazy, kooky investigators. 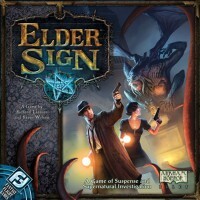 A lot of people compare Elder Sign to Arkham Horror, and with good reason: The investigators are the same (in name at least, but with different rules to fit the game), the Ancient Ones are the same (again, made to fit the game), and the Elder Signs that are the namesake of the game serve the same function: To seal the Ancient One away for good. Both Arkham Horror and Elder Sign use dice; the difference is that Arkham Horror uses regular dice to accomplish tasks with a roll of 5 or 6, where Elder Sign uses specially crafted dice that offer you a chance to accomplish tasks on any roll of the dice. The way the game works is this: In the museum in which the game takes place, there are six locations that investigators can travel to, sometimes more if special events force extra locations. Each of these locations has a number of symbols on it that need to be rolled on the dice in order to collect the location as a trophy, or a number of monsters that need to be beaten (again, by rolling certain symbols). Each time a location is collected, a reward can be gained. In addition, any monsters trophies or location trophies can be exchanged at the museum entrance for bonuses, like clue tokens (which allow you to reroll dice), items, spells, allies, and elder signs. Of course, failure to complete the challenges on the die results in a penalty, usually a lot of stamina or sanity. The goal of the game is to collect enough Elder Signs (either by exchanging trophies for them or as rewards from completing locations) to seal away the Ancient One for good before it awakens, or by beating the Ancient One in a final go-for-broke battle if it DOES awaken. Each investigator in the game contains a unique advantage that will help them in the game. Some can alter the result of dice rolls, while others can aid other investigators with unique abilities, such as allowing a free reroll of all failed dice. They also start with some items that can allow additional dice to roll, or offer more powerful dice that can be used. Some characters may get spells that can handle a variety of effects, like holding dice for use later on, or defeating monsters easier. Now, the game itself is fairly simple. When a player participates in location challenges, he or she rolls as many dice as they have access to (some locations and/or monsters can lock down dice so that the investigators have less options) and try to match the symbols featured on the location. There will usually be three challenges to overcome, and some may require challenges to be attempted in sequence (from top to bottom in order of the card). A player can use die symbols to complete a challenge, but if they don’t have enough to complete a challenge, a player can ‘focus’ a die – this means that they can save a single die roll with a symbol that they want to keep. Only one die may be saved, though other effects can allow additional dice to be stored. Every time a challenge is failed, the player subtracts one die from their dice pool and rerolls the rest to continue to attempt the challenge. If the investigator cannot complete the challenge, he or she suffers the penalty associated in failure and their turn ends. If they succeed in completing all the challenges, the card is collected as a location trophy, and the investigator receives all the awards associated with that location. Time is against the investigators, however; there is a doom clock that counts out the time of each turn. For every investigator turn, three hours pass. Every time the doom clock reaches 12, the mythos occurs, and something bad happens to the investigators. If the investigators dally too long, eventually the clock will enable the Ancient One to awaken. But since time is always moving in the game, there’s nothing you can do about it but just try and weather the effects of the doom clock as best you can. Elder Sign is a game that can be played solo or with a group, and it runs fairly quickly once you understand the game and its rules. Most of the time players take is in conversing with each other to form a strategy with which to tackle the locations in the museum. The die rolling takes a little getting used to with understanding the symbols on the die and what they mean (for instance, the red die has an investigator symbol that is meant to be a wild card for any other symbol), but it is not overcomplicated. A lot of people who have played the game make the statement that the game is easier than Arkham Horror, and in this, I would have to agree based on experience. I have not yet lost an Elder Sign game to date, where I have lost my fair share of Arkham Horror games. I think this is due to being able to interact and cooperate more easily in Elder Sign, as abilities and items are more apt to work together. I do like this game quite a bit, but if I were to muster criticism, it would be in the design of the location cards. the cards themselves can be a little difficult to understand at times, and what you need to do to complete the challenges can sometimes change from one turn to the next. Still, as dice-rolling games are concerned, it’s not bad. Set-up of the game can is not overly exhaustive, but this is not a game that you can generally pick up and play anywhere. Still, it is worth a try, for its unique system of handling tasks and general overall flavor. I’ve had my eye on this game for some time now, and was recently able to pick it up with some birthday money. I’m not really into Lovecraftian horror, but the idea of rolling dice to resolve cards got me interested. Right, it doesn’t take much beyond dice to get me interested in a game. You’re an investigator, and the object of the game is to find enough Elder Signs to seal off a monster (called the Ancient One) to prevent its awakening and entrance into, and subsequent destruction of, the world. You’ll do this by – eh hem – rolling dice. If sealing an Ancient One away with Elder Signs is not exciting enough, or perhaps seems like a cop-out, you may also have the opportunity to get into the ring after an Ancient One’s grand entrance, in which case, you’ll wonder why you didn’t take a lighter case. Of course Fantasy Flight has lifted the bar high for great-quality components. Since the game involves a lot of dice-rolling, this area of the components is very nice. Rounded corners , deep etchings, and just a solid, polished feel make them a pleasure to roll. This area in particular makes a big difference for overall gameplay. The high quality of art on the various types of cards is also what you’d expected from F/F. You can either randomly or specifically choose the character you want to play. Each character card has their own weakness and strengths, along with special abilities. Characters come with a max level of “Sanity” and “Stamina”, which if depleted to zero, causes the character to be “devoured”. The player whose character is devoured can pick a new character; however, all equipment is lost. The center of the game revolves around rolling dice to match their faces to “tasks” on one of the six Adventure cards in play, which are meant to represent locations/events inside the museum at Miskatonic University, a well-known locale in the world of Lovecraft. There’s a lot of variety to the different Adventure cards (48 in all). “Resolving” a card by matching the tasks yields all kinds of items/benefits (including Elder Signs) that can help you win the game. Also, the cards you do resolve become “trophies” which can be traded in for resources at the permanent “Entrance” location (10 trophies yield an Elder Sign, by the way). The passing of time, which yields good and bad events, is represented by a nifty clock that progresses 3 hours at the end of each player’s turn. Mythos cards are turned over when the clock strikes midnight that render “immediate” and “lingering” effects. Usually the immediate effects are bad, and the lingering effects (lasting a whole day) are a mixed bag. Oh, and everyone keeps their eye on the Doom Tracker, which if filled up, signals the failure of the investigators to seal away the Ancient One, thereby ushering in its awful entrance into our world…then it’s show time! Umm, yeah, this game is fun – make no mistake. However, the game is fun more for the mechanics than for a strong theme connected to them. I can play this with my 7 year old son (I don’t let him read the flavor text) and he doesn’t get creeped out and have nightmares, for example. Besides the general mechanics often not making sense with what you’re supposed to be doing in the game world, part of the weakness of the disconnected theme can be attributed to the lack of a board. You’re going to a lot of locations, but they’re represented by only a little art and flavor text on the upper part of the adventure cards, and those cards occupy/replace the same 6 spaces in front of you throughout the game. I really don’t pay attention anymore to where I am in the museum…who cares? This really doesn’t bother me, as I didn’t buy the game to have a Lovecraftian experience, and am even a little relieved for how weak the theme comes through (my son can play!) as I normally don’t want to spend an evening playing a gloomily –themed game. The thing that surprised me is that even though you’re rolling dice like crazy, which suggests a high degree of randomness, decisions do feel relatively important. Assessing what you might be able to accomplish with a given set of Adventure cards, given your resources (stamina/sanity and items) presents interesting decisions. Don’t get me wrong, you ARE going by your gut in many cases (what have I been rolling recently? ), but there are tactics to use that will certainly increase your chances of beating the game. What can I say, it kind of captures the excitement of gambling. Taking a risk by going for that difficult Adventure card, and somehow pulling off a great final die-roll that wins it just feels great! And the filling up of the doom track (revealing the Ancient One) definitely conveys that final stage/big boss feel. It’s like a cool little mini game tagged onto the main one. Really, if the game just ended after the doom track was filled, it would still be a cool. This game was purchased with the intent to develop a taste for Arkham Horror to my gaming group and introduce that game to them. I have since given up on this conquest and turned my gaming attention elsewhere, but this games still serves a good purpose in my gamming collection. This horror based dice rolling game sets you and your team of investigators up in an old spooky museum where the forces of darkness are about to be unleashed to mop the floor with mankind. That is unless you can role the necessary dice to defeat monsters, search through rooms, and collect enough elder signs to seal away the Ancient One from entering this realm. The game is pretty simple to play. There are six room cards in front of you for you to investigate. You complete a room investigation by rolling die to achieve a pattern of die. There are usually two or three different patterns for each room and if you do not get one of the patterns in a single roll then you lose one die and try again. This keeps going until you either accomplish your goal or have no more die to roll. If you accomplish your goal then you are rewarded with spells, companions, or unique items that will give you different bonuses such as extra die or special abilities. You can also gain life or sanity. If you fail your quest then you are dealt damage to your life or sanity, of course if you run out you die. Other penalties may be unleashing a monster or moving the doom tracker one step closer to unleashing certain doom in the Ancient One. There is a clock mechanic that after every turn advances 15 minutes. Every time the clock strikes midnight, a Threat Level Midnight occurs and Michael Scott jumps out of the game box and starts shooting people? No. Okay. But something bad does happen. A new doom card is reviled and usually brings with it some curse that will advance the doom tracker. These are random and can either really hurt you, or sometimes help. Mostly they are used to force you to take actions you would not want to take as they are tougher. The compliant that I hear most about this game is that it is too easy to win. I say, it’s just not true. The game has a lot of variables in it that can make it really easy or pretty tough. There are a number of investigators that each have a special ability and you can pair these up to be almost unstoppable if you want. There are also a number of Ancient Ones to choose from to be the final boss. If you want an easy one or someone who is going to eat you alive, it’s your choice. •	The game is very easy to teach to others. Many compare it to Yahtzee and I won’t go that far, but it is easy to teach. •	The pieces are amazing. This is my first Fantasy Flight game and I can see why some people are FFG groupies. The components are truly top of the line. •	While the theme of the game does not really scare you at all, there is a good amount of suspension and tension from rolling the die. The die add a lot to this feeling of doom. •	There are a good amount of final bosses and investigators to choose from to give the game a good amount of replayability. •	The game says that it can play up to eight. While I’m sure it is possible, I wound not suggest it. I believe less is more. With too many players people are just waiting for their turn to roll the die. •	As a dice rolling game, there is not much strategy. On a scale of ten I would give it a one or two. It is a little light for those looking for a deeper game to sink their teeth into. There have definitely been gaming moments where we felt like we were going to lose and only had one die left to roll. I’ve looked at my gf and said, “Just roll it, but it isn’t going to happen.” And wouldn’t you know it she rolls just what we need. Celebration erupts and high-fives all around. Moments like this make for a great night. It is because we have had a good amount of moments like this Elder Signs is a game that we really enjoy. There is a feeling that we are not going to make it that adds to the theme of the game which is also very enjoyable. While there is not much strategy, it is made up for in fun and entertainment. When writing a short review of this game it’s almost impossible not to mention Arkham Horror. I think Elder Sign is a concentration of Arkham Horror, Fantasy Flight has taken the most important aspects of what makes that game unique and created a shorter, lighter and more accessible game. Elder Sign contains the same great theme that is found in Arkham Horror, luck and randomness plays a big part too and a big bad monster is lurking in the darkness waiting to devour the players and maybe the whole universe. So does Elder Sign replace Arkham Horror? I would say no to that question. I think Elder Sign is a good complement and can be a nice way to introduce new players to the Arkham universe. Even though the rules and mechanics differ between the two games you still get the same feeling and the objectives are almost identical, the way to get there differ somewhat. As you can see in this short text, the game is very often compared to Arkham Horror, too much so I think. I’ve made the same mistake, mostly because I played Arkham Horror first. Elder Sign stands on it’s own and is a great game with or without bothering about Arkham Horror. Others have written great reviews that includes the game mechanics so I won’t repeat that but summarize my feelings about the game. Elder Sign gets two thumbs up from me. Don’t forget to check out the Android and iOS versions, they’re great too. So first off, Elder Sign is very similar to Arkham Horror so people who have played AH should be able to pick up on the end goal of this game fairly quickly. OVERVIEW: Elder Sign takes place in the Arkham Museum located in Arkham, MA (fictional city.) Players fill the roles of different investigators who have been drawn to the museum for some reason. Whether it is pure curiosity or if it is subliminal beckoning of the ancient one, your investigator can’t seem to stop visiting the museum, the itch must be satisfied. As you explore the museum you encounter different events and possibly other realms as certain events can lead to portals to the other realms to open (Abyss, Dreamlands, etc…). Can your investigation uncover enough clues and hidden elder signs to prevent the awakening of the Elder god? If not, can they prevent the elder god from destroying the world? Set up: Set up is not very complicated but it does take some experience to set up quickly. Just like most Fantasy Flight Games, there are a lot of tokens and several different decks but set up is way quicker and way easier than Arkham Horror. WHY I LIKE THIS GAME: Its not a competition so its friendlier, It is much shorter and simpler than Arkham yet leaves me feeling just as satisfied, and you really need to cooperate and help focus dice for other players in order to win. Pros I have heard from others: The museum is a great setting for the lore of the game, the expansions are great, it is easy to learn, involves both team strategy and luck. Possible cons: The rulebook is quite long (but is easy to understand compared to other books of the same size), the game can be quite difficult depending on the luck of what tasks are required, it is not competitive, and some groups of friends just dont do well in co-op games. Overall I recommend this game to people who enjoy push your luck dice games and to people who enjoy cooperative games. Also if you like the Lovecraft universe, this is a great game to buy as the artwork is great and the flavor text on the cards is just an added bonus! In this co-op game 1-8 players take on roles of investigators exploring an old museum filled with ancient artifacts to ward off the awakening of a terrible Elder Evil being. The main game mechanic is rolling custom dice with the purpose of obtaining a series of specific combinations. Different in-game abilities allow you to modify rolls, save rolls for later, add dice and avoid obstacles. Each failure drains characters’ resources and time works against them as well – if they are not able to seal away the evil entity a final battle will ensue where players’ chances are slim at best. The theme and the art are fantastic and immersive. The mechanic is good at supporting the theme – on one hand the die rolling makes it seem too luck-based, yet – all of your successes seem improbable and exciting when they do occur. (as mortals’ efforts against dark extraplanar deities should feel in my opinion). The difficulty can vary quite a bit with some games resulting in cakewalks and others where you get demolished. Could be a little tougher for my liking as it’s the challenge that makes co-ops interesting. The game claims to accommodate 1-8 players but I find anything over 4 to result in down time that leads to disengagement. Works great solo though. With 1-4 players the game is usually done within an hour – the pace is quite brisk. It’s quite approachable and can be taught easily. The dice mechanic can be very appealing to some but offputting to others. Depending on players’ comfort level with this mechanic and affinity for games with rich character (and darker adult themes) – this game is either excellent or adequate. I personally enjoy it immensely and would suggest it. Don’t forget to read out the flavour text! Imagine the worst of the worst, the most sinister of the sinisert, and you’ll be pretty close to that of Cthulhu. This is a horrible being (or god) that is currently resting beyond the deep ocean. But when it returns, it will create chaos and the most horrid nightmares come true for all mankind, enslaving us all. It all comes down to a museum, where ancient and occult artifacts have been collected for a long time. These artifacts have become too close to one another, causing instability to another world. Gateways are starting to open, and the world beyond is complete terror. It is up to you to stop it. So how do you complete such a feat? You will have to use your abilities as an i nvestigator, and approach dangerous and horrific areas. And your tools: dice! If you’ve ever played Arkham Horror, you’ll find that they both have a similar theme. But Elder Sign is set up to be played a whole lot quicker, and is far more easier to learn. Time is against you and your companions. If you can’t stop the gateways from opening, a terrible being will attack and devour you all. If the creature wins over you, the entire world will be enslaved. On your turn you may choose between at least 6 different areas of the museum. Each area comes with their own challenge, and a reward and punishment, depending on the outcome. A challenge is divided into one or more tasks. Each task has to be solved in its entirety, or else it won’t be approved. To complete a task you need to collect the correct set of symbols on the dice, matching those of the task. This has to be done after a single throw of the dice. The dice consist of these symbols: 3 Magnifying glass of values 1, 2 and 3, 1 Terror symbol, 1 Scroll and 1 Skull. If you complete a task, you may select another task, or complete the challenge if that was the last task avaliable. However, if there are more tasks, you’ll have lesser dice to throw, since the other dice are locked on the previous tasks. If the challenge is complete, you may receive cards which give you special abilities, clue tokens which allows for rerolls of the dice, new monsters (it’s a bad thing, but it happens), and the most valuable item: an Elder Sign. If you can collect enough of these, you’ll seal up the gateway and save the world. However, if you fail the task, you are able to make another attempt. But at a price. You must remove one of your dice, giving you less to roll later. Luckily, you may keep one of the dice from the previous result, in the hopes of getting use of it later that challenge. After each player is done, time moves forward. There’s a large clock which keeps track, and for each turn, 3 hours will pass. Whenever it strikes midnight, something horrible may happen. Monsters can appear in the rooms, and the main creature will come ever closer. The problems with monsters is that they add tasks to already difficult challenges. Some challenges require 6 dice to be completed, and if you add a monster, that monster may add additional 2 symbols. Fortunately, it’s not always as bad as that with monsters. The theme of the game falls kind of flat. Although the game itself might be hard and sometimes feel impossible, it’s all about looking at the symbols required and what you have avaliable. It’s not the theme that makes it hard or feel tense, it’s just the game mechanism itself. If you want that thematic feeling, go play Arkham Horror, although it’s a lot harder and has a lot more stuff to it. If you want a more simple Yatzy-inspired game where you’ll have several options to choose from, then this might be the game for you. And being a cooperative game, you either all win, or none of you will win. Being cooperative, I feel that this game removes the alpha leader role a bit, which is very fortunate. There is no “right way” in this game, it’s all about what you feel you are able to complete of the tasks. Luck is a great factor in this game. I enjoy this game, but not if I play it alone. 2 or 3 persons is fine for this game. Any more, and you’ll probably do some waiting. However, if you do choose to purchase this game, here’s a requirement from me: download the new rules from Fantasy Flight Games. The one that comes in the box will fill you with questions and feel very incomplete. That’s because they are. The new rules are very well done and come with a lot of examples. When I heard about Elder Sign, my first thought was, “thwarting an otherworldly eldritch horror and getting to roll a bunch of dice at the same time? Where do I sign up?” For anyone with an interest in the Lovecraft theme and an appetite for dice-rolling like me, this would seem like a no-brainer. After playing several times, I have to say that I definitely enjoy the game, but it isn’t quite a lighter version of Arkham Horror. From a components standpoint, Fantasy Flight Games has lived up to their usual reputation. The dark artwork and flavor text on the cards really help to convey the sense of otherworldly dread that is expected to accompany any trip into the Lovecraft universe. The cards and markers are well-made and come in the usual variety of sizes. The clock that is used to mark the arrival of yet another midnights is very functional and sturdy. And the custom dice are just plain cool! In terms of gameplay, I was a little skeptical at first, but I find that I enjoy the dice mechanic that is used to resolve the various adventures and move the game forward. There is a bit of resource management as you decide when to use clue tokens and items to reroll or add extra dice, and there are some strategic decisions to make as you determine which investigator is best suited to tackle each adventure. The random nature of the dice may turn some players off, but I found it to be very fun and engaging. It’s a great feeling to roll those two “terror” symbols to complete the task when you’re down to your last two dice. The addition of random monsters based on the adventure and mythos cards also adds a challenge to the game. Which leads me to one problem with the game. If your luck is with you, it can definitely be easy. I have won pretty handily on a couple of occasions because the dice just went my way. On the other hand, if you’re having a bad juju day, you might not be able to complete a task to save your life (or your sanity, for that matter). Some have complained that the game is too easy, but I like that it has the potential to be won in under an hour. I do wish the narrative was a little more developed. Sometimes, instead of feeling that you’re part of a dark race to save mankind from unspeakable horror, you feel like you’re just moving your marker and rolling some dice, and then moving your marker and rolling some more dice, etc. Despite this, I thoroughly enjoy the game and would recommend it to anyone. The game is easy to teach and to pick up for someone who plays casually, and the cooperative nature may be more fun for those who are not be well-versed in other heavier games. There are enough decisions to keep players engaged, and the theme is enjoyable enough to attract those who enjoy games with a little more substance. The relatively short duration makes it an easy game to play more than once in a night and also makes it less intimidating than a full-on attack of Arkham Horror. This is definitely a game that I will continue to play. The focus of so many exotic curios and occult artefacts at the museum is the cause of a new threat to Arkham. They weaken the barriers to the beyond, letting Gates open and monsters in, and laying a path for an Ancient One to make its way to Earth and lay waste to mankind. Only a number of dedicated investigators have the knowledge and will, and perhaps the allies and the tools, if not necessarily the time, to locate a sufficient number of Elder Signs that will seal the portals and prevent the arrival of the Ancient One. This is the set up for Elder Sign, the latest board game from the designers of Arkham Horror that uses the same art work and trade dress as seen in both Arkham Horror and the recently released Mansions of Madness. Fantasy Flight Game’s third board game of facing Lovecraftian horror, Elder Sign is, like Arkham Horror, a co-operative game designed to be played by between one and eight players, with a playing time of between one and two hours. The co-operative element means that the opponents faced by players are not each other, but by the game itself and its mechanics. It also means that there is a time component to Elder Sign, not only in terms of a time limit before the Ancient One arrives, but also in terms of events (of a random nature) that occur regularly throughout the game’s play. In order to counter the effects of these events, and eventually, the arrival of the Ancient One, the Investigators will explore the Museum and have Adventures within its confines, the aim being to marshal the resources necessary to save the world. Elder Sign is comprised of several sets of large and small cards, various tokens and counters, a card clock, and a set of customised dice. The large cards are divided between decks of Investigators, Adventures, and Ancient Ones, whilst the small cards are divided between decks of Common and Unique items, Spells, and Allies – all beneficial to the Investigators, whilst Mythos cards describe the events and effects that occur every time that the clock strikes Midnight and linger until the clock strikes Midnight again. There are sixteen individual Investigators to choose from. Each one gives an Investigator his maximum Sanity and Stamina, his Starting Items, and a special ability. For example, Dexter Drake is a magician who whenever he gains a Spell card during play, he always gains an extra one, whilst Gloria Goldberg is an author whose Psychic Sensitivity grants her extra dice to roll when visiting Other World Adventure Cards. During a game, the Investigators will face one of eight Ancient Ones. They include Azathoth, Cthulhu, Hastur, Ithaqua, Nyarlathotep, Shub-Niggurath, Yig, and Yog-Sothoth. Each one gives the number of Elder Signs needed to prevent it from being awoken, which occurs when the Doom Track on the card is filled; a special ability that applies throughout a game; a means of Attack once it is awoken; and a Combat Task that must be completed by the Investigators to weaken and eventually banish it from the Earth. So for example, for Cthulhu, the Special Ability is “Dreams of Madness,” which reduces every Investigator’s maximum Sanity and Stamina by one. Thirteen Elder Signs are needed to banish this Ancient One, but it only needs eleven tokens for the Doom Track to be filled and Cthulhu to be woken up. When Cthulhu does Attack, it reduces each Investigator’s Sanity or Stamina by one and adds another token to his Doom Track. The latter is a problem because in order to defeat an awoken Ancient One, the Investigators have to remove all of the tokens from the Doom Track. To remove a Token, an Investigator has to roll the given Combat Task. Each Adventure Card has a title, a Trophy value, some flavour text, a set of Tasks that need to be completed if an Investigator is to succeed at the Adventure itself, and a set of Penalties for if an Investigator fails to complete the Adventure and a set of Rewards if he does. Some Adventure Cards also have a Terror effect that occurs if an Investigator does not complete a Task on each roll and some stipulate that their Tasks have to be done in order rather than the order of a player’s choosing. Most of the Adventure Cards take place in the Museum such as “Remains of the High Priest” and “The Gift Shop,” but others take place off world, like “The Dreamlands” and “The City of the Great Race.” In general, the Rewards and Penalties for the Other World Adventure cards are greater and they are also harder to complete. Penalties on an Adventure Card can deduct Sanity and Stamina from an Investigator, cause a Monster to appear, advance the Clock, or add another Doom Token to the Doom Track on the Ancient One Card. Rewards can grant Items, Spells, and Allies as well as Elder Signs and Clue Tokens. They can also open Gates to Other World Adventure Cards. Not all of the Rewards are good – sometimes they are mix of the good and the bad. The small cards represent Common and Unique items, Spells, and Allies as well as Mythos effects. They add extra dice to a Task attempt or alter dice rolls; enable an Investigator to restore Sanity or Stamina; or in the case of some Spells, let an Investigator store dice results between attempts at a Task. Allies grant another special ability, such as Richard Upton Pickman’s being able to change results on the dice in a certain fashion. Each Mythos card has two effects. The first occurs as soon as it is drawn, whilst the second lasts until the next Mythos card is drawn. For example, immediate effect of “The Stars Align…” is to add a Doom token to the Doom Track, whilst the lingering effect, “…Before Reason Fails,” lets the Tasks on Adventure Cards be done in any order, even if they stipulate that they must be done in order. The game includes Sanity, Stamina, Investigator, Clue (these allow re-rolls of the dice), Elder Sign and Doom Tokens. There are also Monster Markers, little card strips that when summoned can replace Tasks on an Adventure Card to make them more difficult to complete. Each Monster Marker has a piece of flavour text on the reverse and a Trophy value. The final components are the card Clock, used to measure the passing of time and determine when new Mythos cards are drawn; the Museum Entrance card; and the dice. The Museum Entrance card represents somewhere where an Investigator can go to “Receive First Aid,” “Search the Lost & Found,” or “Buy A Souvenir.” This usually requires an Investigator to expend Trophy points won by completing Adventure Cards or defeating Monsters, or to expend various tokens or items. The dice are the heart of the game, rolled by an Investigator to try and match the symbols listed for each Task on the Adventure cards. They come in three colours. The six green dice are the most common and all of them are usually rolled when a Task is attempted. The yellow dice gives better results than a green die whilst the red dice gives better results than the yellow die. It usually takes the expenditure of a Common Item card to add the Yellow die to a player’s roll and the expenditure of a Unique Item card to add the red die. There is only the one yellow and one red die in the game. Game set up is quick and simple. Each player selects an Investigator and receives its starting items. An Ancient One is chosen and placed on the table where everyone can see it along with the Clock – which is set at midnight, the Museum Entrance card, and six Adventure Cards. The first Mythos card is drawn and takes effect. On his a turn, a player sends his Investigator to the chosen Adventure Card. He takes up the green dice and the yellow or red die if he decides to use an Item or has a Special Ability. The Tasks are arranged on each Adventure Card in lines and with each roll of the dice, a player must match the symbols on a single line with those on the dice. He can only attempt to match the symbols on one line at a time and if he does, he places those dice on the symbols on the card. He can then go on to roll for the Tasks on the other lines. If he fails to roll the right symbols for a line, he can continue rolling, but must discard a die each time he fails to match the symbols. On some Adventure Cards, there is a Terror effect for failing to match any symbols and rolling a Terror on the dice. If the player completes all of the Tasks, he receives all of the rewards at the bottom of the Adventure Card. He also receives the Adventure Card to keep as a Trophy which can be spent at the Museum Entrance for various effects. If he does not complete any of them, he suffers the penalties also given at the bottom of the Adventure Card. Alternatively, a player could have sent his Investigator to the Museum Entrance. As soon as a player’s turn is over the Clock is advanced one quarter of the way round its face. When the Clock reaches Midnight a new Mythos Card is drawn and its effects applied. Since the two effects on the Mythos Cards vary greatly, often the players will find themselves hoping for one with less dangerous effects. So drawing one every fourth turn is another way in which Elder Sign can turn up the tension. Our sample Adventure Card is “Lights Out.” Harvey Walters’ player decides that the reward of an Elder Sign is worth going for. The individual Tasks on each line are not difficult in themselves, but the Arrow symbol beside them means that they have to be done in order. Harvey has at his disposal one Unique Item – a copy of “Cultes des Ghoules” that lets him add the red die to a Task attempt, and one Spell card, the spell “Flesh Ward,” which lets him store a die roll between attempts. Harvey decides that he will use both, meaning that he rolls both the green and the red dice. On the first roll, Harvey gets the results of 1 Clue, 2 Clue, Scroll, Scroll, Skull, and Tentacle on the green dice. On the red die, he gets the Wild Card symbol, which can be used to match any other symbol. The 1 Clue and 2 Clue symbols are enough to complete the Task on the first line and places those dice on the Adventure Card. He takes the red die and stores it on the Spell Card. This leaves him with just four green dice to roll. On the second roll, Harvey needs two Skulls, but is unlucky and gets neither. He is forced to discard one of the green dice leaving him with three to roll. He gets 1 Clue, 3 Clue, and a Skull. He needs another Skull, so uses the Wild Card symbol on the red die that he stored earlier to match the symbols needed to complete the Task. This leaves him with just two dice and needing two Scrolls to complete the third Task and the whole Adventure Card. He rolls a Scroll and a Tentacle. Ordinarily this would not be enough, but Harvey’s Special Ability allows him to change a single Tentacle result on the dice to a Scroll, and as soon as he does he has completed all of the Tasks and the Adventure Card. As a reward, he gains an Elder Sign and a Spell Card plus the Adventure Card to spend as a Trophy. A new Adventure Card is then added. If he failed, he would have lost two Stamina and added another Token to the Doom Track on the Ancient One’s card. When the Doom Track is fully filled on the Ancient One’s card, it awakes and comes to Earth. At that point every Investigator has to face it, battling to remove the Doom Tokens from the Track. This uses the same dice mechanics as for the Tasks on the Adventure Cards. Should either the Sanity or Stamina of an Investigator be reduced to zero, he deemed to have been devoured! His player must start afresh with a new Investigator, including new Starting Items. He loses those previously held by the now devoured Investigator. If an Investigator is devoured by the awakened Ancient One, no new Investigator can join the fight against him. Winning a game of Elder Sign is not easy, but it is made all the harder when certain Adventure and Mythos Cards and Monsters appear that have the Locked Die icon on them. These temporarily remove a die that matches the colour on the icon from the game, thus reducing the number of dice each player has to roll on his turn until the Adventure Card or the Monster that has confiscated the die has been dealt with, or the effects of the Mythos Card have been replaced with a new one when the Clock strikes Midnight. Fortunately, in addition to using Investigator Special Abilities and the various Spell and Item Cards to give themselves an advantage, players can do things. First, Clue Tokens allow players to re-roll dice. Second, they can Focus a die – saving a die result for a subsequent Task, but at the cost of discarding another die, or Assist another player on the same Adventure Card – giving them a die result that they can use on their turn in attempting the Tasks on that Adventure Card. The downside to this is that it reduces the number of dice every player has to roll until the Assisted player’s turn. Physically, Elder Sign is up to Fantasy Flight Games’ usual standards. Everything is of a high quality as you would expect, and the illustrations, all of which will be familiar to players of Arkham Horror and Mansions of Madness, are excellent. The rulebook is perhaps a little succinct at twelve pages, with some more examples of play being needed to better get the play of the game across. If there is an issue with the components, it is that some of the components are just a little too small for easy handling and thus some of the artwork’s effectiveness is lost. Elder Sign is described as a co-operative dice game, but whilst the dice rolling lies at the heart of mechanics and game resolution, the game is really a “co-operative dice and decision” game. The players have to decide where their Investigators have to go and which Adventure Cards they should attempt to resolve, this decision usually being influenced by the number of Elder Signs available as Rewards on the current Adventure Cards or the Adventure Cards or Monsters with the locked dice on them. Of course, sometimes a player will attempt to resolve an Adventure Card for the Item and Spell Cards that it would reward him. They also need to decide how to apply their dice rolls, and in all of this, a player is free to solicit advice from the other players. This then, is the game’s “co-operative” element. In comparison with Fantasy Flight Games’ other titles of Lovecraftian investigative horror, Elder Sign is simpler, more direct, and quicker to play. It is less location focused than either Arkham Horror or Mansions of Madness, so it has less of a narrative structure to it, but because a player is rolling the dice multiple times during his turn, it actually feels like you are doing more than in either of those games, especially in Mansions of Madness where a player’s actions feel severely limited. The combined effect of the reduced narrative structure in comparison to Fantasy Flight Games’ other Lovecraftian board games and the focus on the dice rolling to resolve the Adventure Cards is to make Elder Sign feel mechanical in play. It is possible that much of the game’s flavour and colour could fade into the background if the players do focus too much on the dice and the mechanics. That said, this is not necessarily an issue for the more casual player. With eight Ancient Ones to face and forty-eight Adventure and eight Other World Adventure Cards, and sixteen Investigators to play, the core set for Elder Sign offers plenty of replay value. Plus, the format is ripe for expansion. The actual downtime between turns is not necessarily high, but of course with more players there is a slightly longer wait. When it is a player’s turn, the rolling of the dice to resolve the Tasks of an Adventure Card can be quite tense, which just adds to the atmosphere and feel of the game seen in the art. Above all, Elder Sign captures much of the tension and atmosphere of fighting desperately against the Mythos. That it does so in such a self-contained and time constrained manner is a sign of a good design, at the heart of which is the clever, tension inducing dice rolling. Not too complex for the casual player, but still evocative for the Lovecraft devotee. As I enter my third year of modern board gaming, I find there are an ever expanding number of titles I want to play. I keep adding games to my wish lists, and new ones appear. It’s nearly impossible to purchase, learn and play, and store every game that interests me. The more I discover about my gaming preferences, the more I yearn to try additional titles. My gaming circle seems to gravitate toward cooperative games, so I am especially inclined to try any coop that plays well with small groups and in under an hour. Elder Sign (2011) is hardly a new release, but it is new to me. I have read many reviews of Elder Sign, and most are favorable. The recurrent knock on Elder Sign is that it is a luck filled, dice chunking affair that is too easy to win. After more than a dozen plays, I have found that the odds of winning are quite favorable. This is particularly true with certain investigators. And that is an issue with many cooperative games, as some “roles” seem to have distinct advantages. Most games designers address this issue by directing players to randomly choose their roles at the beginning of the game. Random distribution works, if enforced, but how many players adhere to this approach? Once I familiarize myself with a game, I find that I pick one or two roles and use them every time I play. So how does the game look and feel? The many components look great. The artwork on the sturdy cards is gorgeous, and the small bits and markers are printed in vibrant colors. Especially neat is a large clock face, which serves as a timer players advance three hours at the end of each turn. The only components that seem lacking are the player tokens themselves. They are roughly two centimeter, flat squares that are hard to distinguish from one another. I would have preferred colored pawns that matched colors on the player investigator cards, but that’s a minor quibble. The custom dice are solid feeling and clearly etched in easy to read contrasting colors. Gameplay is fairly straightforward in Elder Sign. One to six players choose an area of the museum (represented by six face-up “Adventure Cards”) to explore, and then they must complete tasks printed on the cards. The tasks are rows of symbols that correspond to those on the player dice. Players roll the dice and try and collect a die for each of the symbols in the task. When the desired roll is not achieved, the player must discard one die and try again to roll the desired task symbols. If a player exhausts his supply of dice and or cannot complete the tasks, he fails the adventure. Failed adventures penalize a player by causing him to lose health and sanity. If a player’s health or sanity reaches zero, his character is devoured. Additionally, failed adventures may result in the appearance of monsters and doom tokens. Completed adventures give players rewards including spells and weapons to help them tackle tough adventures and trophies to be exchanged for health and sanity restoration or for Elder Sign tokens. Some adventures also reward players with Elder Signs. Players must collect a specified number of Elder Sign tokens before the doom track is filled, or the Ancient One awakens. The game includes eight Ancient Ones of varying strength and difficulty, and each has its own mode of attacking players should it awaken. So far, I have only awakened the Ancient One once, and I lost the game badly. Watching the doom track fill with tokens adds a real sense of tension and impending doom. Also included in gameplay are Mythos cards. They appear at the beginning of the game and each time midnight comes. Mythos cards usually cause some negative event like having a monster appear or adding a token to the doom track. They bolster the eerie, supernatural theme of wandering after hours in spooky Arkham Museum. Elder Sign is a good, but not great cooperative game. The horror theme is easy to embrace, and rules are straightforward. Most of the game’s components are very good. And, given the number and quality of the cards, bits, and pieces, the game is a great value. I suspect there are ways to make the game more difficult without altering play. The simplest idea might to begin the game with two to four tokens on the doom track, or lock one of the dice for a portion of the game. Then the Ancient Ones would rise to create real challenges for players. Elder Sign is a cooperative dice game for 1-8 players that takes 1-2 hours to play. The game includes 8 custom dice and a LOT of cards and tokens. The players’ goal is to seal the gate with Elder Signs so that the chosen Ancient One does not awaken, or to battle the Ancient One if it awakens. Each player will select a unique investigator that gives them a special power and some starting cards. On their turn, players will either stay at the entrance to the museum or attempt to resolve an adventure card. Staying at the museum entrance will let them heal their sanity and stamina, buy souvenirs, or search the lost and found, which can help them get vital items for their quest. Attempting the adventure cards is the core of the game, with the players rolling the dice in an attempt to match the symbols on the tasks listed on a given adventure. Accomplishing these goals earns the players items and Elder Signs, while failure is usually punished by the loss of stamina and sanity. I am generally not a fan of horror themes, Lovecraft or otherwise, but when I tried this game at GenCon, I knew I had to have it in my collection. I have played this game 5 times already (and lost 2), and every game has been different and interesting. With 16 investigators and 8 Ancient Ones, each having a different game affecting ability, every game has been different and exciting. While dice games are inherently based in luck, I feel that most of the time the game will be won or lost on making the right decisions, not on a single lucky roll (though I have seen one or two). The only problem I might have with the game is that each player’s turn is played 1 at a time, so with 7 or 8 players there may be a LOT of downtime between turns. That being said, it is not at all necessary to play with that many people, so that makes for a minor complaint. Elder Sign is truly an amazing game. I was hesitant at first to add Elder Sign to my Mythos game collection. I’m a huge fan of Lovecraft and the Mythos, but dice games have never really been my thing. That being said, I’m glad I made an exception in this case. Elder Sign is a lot of fun, and makes a great addition to the Arkham Horror Line from Fantasy Flight Games. The game has a lot of common elements to Arkham Horror, including artwork – the investigators face a series of adventures in the Museum in Arkham seeking to prevent the Ancient One from awakening by sealing off the way using a series of Elder Signs. The game is quite rich in story and atmosphere, both good points for someone like me when evaluating a game. It doesn’t have as much to it as Arkham Horror (especially if you are used to playing AH with its large array of expansions), but Elder Sign is every bit as fun while being a lot faster to set up and play. Unlike the board games in the Horror line, Elder Sign also requires significantly less space to play. All in all, for fans of the Arkham Horror game line or Mythos games in general, Elder Sign gives you a rich, fast, fun game that will leave you coming back for more. There’s already one expansion, Unseen Forces, which adds some very cool elements to the game, including a new set of cards of the Museum Entrance, blessings and curses. Add a Review for "Elder Sign"